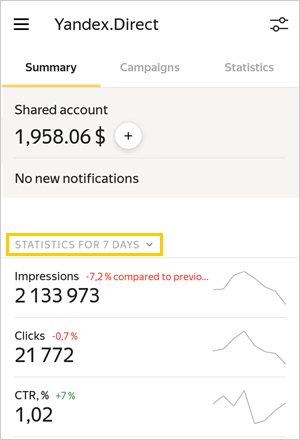 On the Summary screen you'll see basic information about your account: your shared account balance, number of new notifications, and summary statistics. From this screen, you can enable your shared account (if you haven't yet), add funds to it, and go to the notifications and account statistics screens. 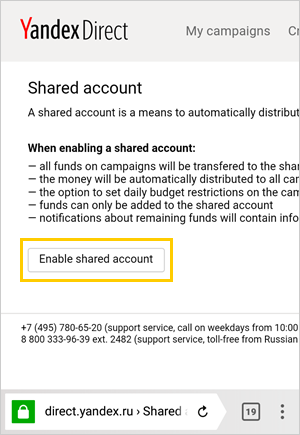 How do I enable a shared account? How do I select a time period for statistics? How do I change the order of metrics? On the Summary screen in the Shared account block, tap + Enable. Confirm your choice in the Direct web interface. Enter your username and password in the browser window that opens. Tap Log in. Note. If you are logged in to the Yandex browser under a different username, you will need to log out first. Tap on the heading of the statistics section and select a time period from the list. To manually set a time period, tap the start date in the calendar, followed by the end date. 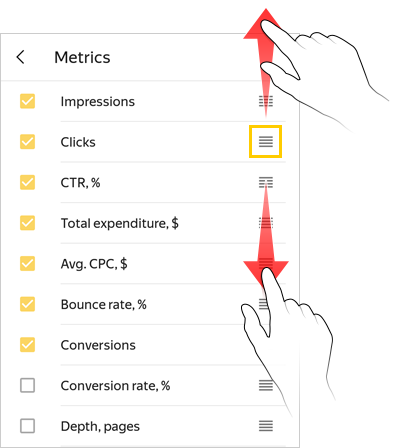 Tap → Metrics and drag the metrics to their appropriate places in the list using the button. Then click Done. The statistics overview contains information on the first five metrics. How do I enable a shared account?How do I select a time period for statistics?How do I change the order of metrics?